It is difficult to understate the impact of homecourt advantage. It has been estimated that a team gains about four additional points by playing at home, which could easily tilt the scales in close games. From the looks of it, Tech has a bigger advantage than most. But how does Tech’s home court advantage stack up to others? How can we quantify the Thrillerdome? It is tricky to put home-court advantage into numbers because of the intricacies of scheduling. For example, most major basketball schools schedule a number of weaker schools to play against at home during the non-conference portion of their schedule, making “buy games,” as they are called. As a result, teams will post better numbers at home than average because they are playing a significantly weaker schedule at home compared to road games. As a result, Power Five teams may display larger home-court advantages than weaker teams. Another interesting task is comparing the home field advantage under former Tech head coach Brian Gregory and under current head coach Josh Pastner, but complicating this analysis is the inconsistency of home-court advantage. Ken Pomeroy, noted college basketball analyst, found that based on home court advantage by points, home court advantage was not usually well correlated from year to year. While a consistent advantage does exist, the reliability of such an advantage is slight, so this factor will be considered through the analysis. 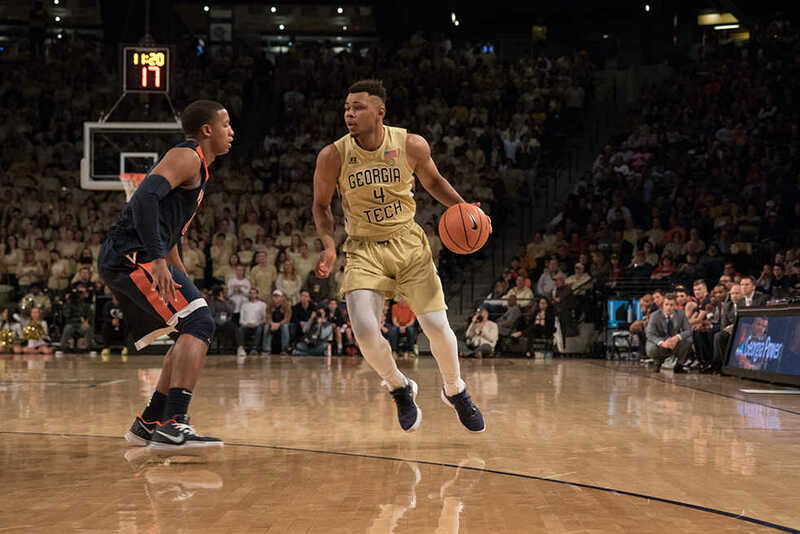 The Jackets are one of the top teams in the country in terms of win percentage at home minus win percentage on the road — Tech’s difference of 53.6 percent ranks No. 31 among 351 D1 college basketball teams. Despite this, Tech’s point differentials are fairly lackluster: the Jackets’ point differential at home was only 419, ranking No. 109 in the country. Notice Tech’s placement on the chart featured on page 22 — the further above the line a team performs, the greater the team performs in winning close games. The Jackets clearly are in the upper reaches of winning close games and outperforming their scoring margins, an impressive feat in the ACC. One team in particular stands out with regards to outperforming margins in close games — Pittsburgh, despite having a scoring margin at home only 120 points greater than their away margin, posts a home win percentage 48.8 percent higher than their away win percentage, far greater than that which would be predicted by a linear margin. Tech also has a significant advantage in free throws. Tech’s free throw percentage minus their opponent’s is 13 percent higher at home compared to being on the road, the sixth best figure in the country. Rattling opponents and causing them to miss free throws is an important job for fans, and Tech is the best in the ACC by this metric by far. The next closest is Florida State at 9.6 percent. Checking if Tech’s home court advantage is the same or different under Josh Pastner as head coach as it was under Brian Gregory shows that Tech posted a 60 percent win rate at home, but only 27.5 percent away. Under Pastner, Tech has been exceptionally better at home, winning 75.8 percent of their home games, but slightly worse on the road at 22.2 percent. Ultimately, Pastner appears to be enjoying a larger home-court advantage than Gregory did. What gives teams a home court advantage? Studies discuss several factors, but it ultimately goes to the crowd, which has been well correlated with home court advantage. Teams with a large, passionate crowd tend to perform better at home than on the road. Home court advantage is actually a perfect example of the impact of the psychology of a game. Opposing teams tend to shoot worse because they are rattled by large crowds. In addition, referees are subconsciously pressured to call fouls on visiting teams more frequently than the home team. A foul called upon a player from the home team generates boos, as will a referee not making a foul call on something that may appear to the crowd to be a foul. If the referee calls a foul on a visiting player, however, that will generate cheers from the home crowd. Referees’ anticipation of these reactions can make all the difference. Tech fans are technically eighth on the team in score (4.1 PPG). It is a testament to the impact that crowds have had in the Pastner era, and the role that they must have in order for the Jackets to take the next step from spoiler to contender.